Our best-selling original: The Smash Terminator® Classic Series Sports Armband combines hard-wearing Neoprene and soft, flexible Lycra to create an ultra lightweight, comfortable and high-quality fitness product at an affordable price. The perfect Fit: Designed specifically for the iPhone 5s/5c/5 & SE and available in a range of six eye-catching colours. Two strap slots and adjustable Velcro fastening make this the perfect fit for almost any arm. Will comfortably accommodate a 15″ bicep. Use it anywhere: Whether it’s pounding the streets of your local fun run, hitting the gym for some weight training, or even just enjoying sport with friends, our Classic Series armband is the ideal workout companion. keep all your favourite music and apps readily accessible, whilst ensuring your precious Smartphone stays safe, dry and secure during use. 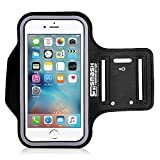 Smash Terminator® Classic Series Sports Armband for iPhone. Safely carry and use your iPhone on the go, while retaining full access to all your favourite music and apps. Constructed from hard-wearing Neoprene and soft, flexible Lycra, the Classic series is lightweight, comfortable and built to last! Designed for the iPhone 5s/5c/5 & SE but may also be suitable for other Smartphones with displays between 4 & 4.5″.